This study examines the relationship between young boxers’ perceptions of self-esteem and their personal and social responsibility. The participants consist of two hundred and seventeen young male boxers. They completed both a 4-point Likert-type questionnaire assessing their self esteem and a 6-point Likert-type questionnaire assessing their personal and social responsibility. Results of the study revealed that young boxers were more likely to report higher levels of self-esteem and personal responsibility and social responsibility. Simple correlation and multiple reggression analyses revealed young boxers’ self-esteem was positively related to their personal and social responsibility. This finding results reinforce the view that people who appreciate themselves and have a sense of personal empowerment will improve their personal and social responsible behaviors. This study allows us to gain insights into an effective strategy that is relevant to society and that can reduce the growing incidence of social and personal problems. Agbuga, B. (2013). Students’ perceptions of personal and social responsibility in physical education. Manuscript submitted for publication. Agbuga, B., Xiang, P., McBride, R. (2010). Achievement goals and their relations to children’s disruptive behaviors in an after-school physical activity program. Journal of Teaching in Physical Education (SSCI), 29 (3), 278-294. Ames, C., Ames, R. (1984). Systems of student and teacher motivation: Toward a qualitative definition. Journal of Educational Psychology, 76, 535-556. Ascı, F. H. (1999). Self concept and sport. Sport psychology course, P Bayar (Review), Ankara, Bagirgan Press. Bagley, C. ( 1989). Development of a short self-esteem measure for use with adults in community mental health surveys. Psychological Reports, 65, 13-14. Bagley, C , Mallick, K. (1978). Development of a short form of the Piers Harris self-concept scale. Educational Review, 30, 265-68. Baumeister, R. (2005). Rethinking self-esteem: why nonprofits should stop pushing self-esteem and start endorsing self-control. CA: Stanford Social Innovation Review, 3(4), 34-41. Baumeister, R. F., Campbell, J. D., Krueger, J. I., Vohs, K. D. (2003). Does high self-esteem cause better Performance, interpersonal success, Happiness, or healthier lifestyles? Psychological Science in the Public Interest, 4(1), 1-44. Baumeister, R. F., Smart, L., Boden, J. M. (1996) Relation of threatened egotism to violence and aggression: The dark side of high self-esteem. Psychological Review, 103(1), 5-33. Berry, T. R., Howe, B. L. (2000). Risk factors for disordered eating in female university athletes. Journal of Sport Behavior, 23, 207-219. Blascovich, J., Tomaka, J. (1991). Measures of self-esteem. In J. Robinson, Shaver & L. Wrightsman (Eds). Measures of personality and psychological attitudes. New York: Academic Press. Brand, J. A., Dodd, D. K. (1998). Self-Esteem among college men as a function of greek affiliation and year in college. Journal of College Student Development, 39(6), 611-615. Crocker and Park. Psychological Bulletin, 130(3), 425-429. Cuhadaroglu, F. (1986). Self-esteem in adolescence. Unpublished Province Thesis. Hacettepe University Medical Faculty, Ankara. Downing, J. H. (1996). Establishing a proactive discipline plan in elementary physical education. Journal of Physical Education, Recreation and Dance, 6, 25-30. DuPaul, G. J., Hoff, K. E. (1998). Reducing disruptive behavior in general education classrooms: The use of self-management strategies. School Psychological Review, 27, 290-303. Freiberg, H. J. (1999). School climate: Measuring, improving, and sustaining healthy learning environments. London: Falmer Press. Gencer, E. (2012). Goal orientation, motivational climate and self-esteem in boxers, TOJRAS: The Online Journal of Recreation and Sport, 1(1), 17-29. Gencer, E., Ilhan, E. L. (2012). Examining badminton athletes’ self-esteem. Nigde University Journal of Physical Education And Sport Sciences , 6(1), 94-101. Hellison, D., Cutforth, N., Kallusky, J., Parker, M., Steihl, J. (2000). Youth development and physical activity: Linking universities and communities. Champaign, IL: Human Kinetics. Hellison, D., Martinek, T. (2006). Social and individual responsibility programs. In: D. Kirk, D. Macdonald, & M. O’Sullivan (Eds. ), The handbook of physical education (pp. 610-626). Thousand Oaks, CA: Sage. Johnson, L. D., O’Malley, P. M., Bachman, J. G. (1999). Drug trends in 1999 among American teens are mixed. University of Michigan News and Information Services, 1-35. Kaplan, H. B. (1975). Self-attitudes and deviant behavior. Pacific Palisades, CA. : Good-year. VA Sadock (Eds), 7th edition. Lippincott Williams & Wilkins, Philadelphia. Lavay, B. W., French, R., Henderson, H. L. (2006). Positive behavior management in a physical activity setting (2nd ed.). Champaign, IL: Human Kinetics Publishers. Leary, M. R., Tambor, E. S., Terdal, S. J., Downs, D. L. (1995). Self-esteem as an interpersonal monitor. The sociometer hypothesis. Journal of Personality and Social Psychology, 68, 518– 530. Li, W., Wright, P. M., Rukavina, P., Pickering, M. (2008). Measuring students’ perceptions of personal and social responsibility and its relationship to intrinsic motivation in urban physical education. Journal of Teaching in Physical Education, 27, 167-178. Maner, J. K., Park, L. E. (2009). Does self-threat promote social connection? The role of self-esteem and contingencies of self-worth. Journal of Personality and Social Psychology, 96(1), 203- 217. Martens, R. (1987). Coaches guide to sport psychology, Champaign, IL: Human Kinetics. Martinek, T., Perez, L. M. R. (2005). Promoting positive youth development through a values-based sport program. International Journal of Sport Science, 1, 1-13. Nelson, M. B. (1994). The stronger women get, the more men love football - sexism and the American culture of sports. New York, New York: Avon Books. Nieman, P. ( 2002). Psychosocial aspects of physical activity, Paediatrics and Child Health,7(5), 309– 312. Okseon, L. (2012). Teacher Candidates' Implementation of the Personal and Social Responsibility Model in Field Experiences, Physical Educator, 69(2), 150-170. Oswald, K., Safran, S., Johanson, G. (2005). Preventing trouble: Making schools saferplaces using positive behavior supports. Education and Treatment of Children,28, 265-278. Pedersen, S., Seidman, E. (2004). Team sports achievement and self-esteem development among urban adolescent girls. Psychology of Women Quarterly, 28, 412-422. Roid, G., Fitts, W. (1988). Tennessee self-concept scale. Los Angeles: Western Psychological Services. Rosenberg, M. (1985). Self-concept and psychological well-being in adolescence. In R.L. Leaky (Ed. ), The development of the self (pp. 205–246). New York: Academic Press. Sanaktekin, O. H., Sunar, D. (2008). Persuasion and relational versus personal bases of self-esteem: Does the message need to be one- or two-sided? Social Behavior and Personality, 36(10), 1315-1332. Treasure, D. C., Monson, J. T., Lox, C. L. (1996). Relationship between self-efficacy, wrestling performance, and affect prior to competition. The Sport Psychologist, 10, 73-83. Tremblay, M. S., Inman, J. W., Williams, J. D. (2000). The relationship between physical activity, self-esteem, and academic achievement in 12-year-old children. Pediatric Exercise Science, 12, 312-323. Trzesniewski, K. H., Donnellan, M. B., Moffitt, T. E., Robins, R. W., Poulton, R., Caspi, A. (2006). Low self-esteem during adolescence predicts poor health, criminal behavior, and limited economic prospects during adulthood. Developmental Psychology, 42, 381–390. Ucan, Y., Caglayan, N. (2012). Comparison of self-esteem scores of individual and team sport athletes and nonathletes, Nigde University Journal of Physical Education and Sport Sciences, 6(3), 279-287. Watson, D. L., Newton, M., Kim, M. (2003) Recognition of values-based constucts in a summer physical activity program. Urban Review, 35, 217-232. Weissberg, R. P., Kumpfer, K. L., Seligman, M. E. P. (2003). Prevention that works for children and youth. American Psychologist, 58, 425-432. Whitehead, J. R., Corbin, C. B. (1997). Self-esteem in children and youth: The role of sport and physical education. In K. R. Fox (Ed. ), The physical self: From motivation to well-being (pp.175-204). Champaign, IL: Human Kinetics. Wray D. L., Stone R. E. (2005). The role of self-esteem and anxiety in decision making for self versus others in relationships. Journal of Behavioral Decision Making, 18(2), 125-144. ISNAD Ağbuğa, Bülent . "Relationship between Self-Esteem and Personal and Social Responsibility in Young Boxers". 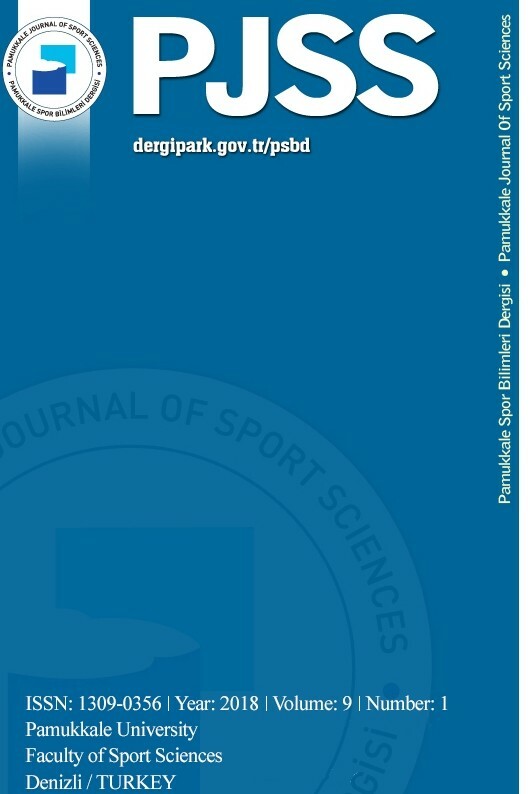 Pamukkale Journal of Sport Sciences 5 / 2 (May 2014): 48-59.